Use railroads, trucking lines, buses, airplanes and ships to outmaneuver ruthless competitors and see who is best at meeting the needs of a growing metropolis. Cash in on a world of opportunity moving raw materials, goods and people efficiently from one destination to another. Rake in huge profits as the years advance from 1900 to the year 2000 and beyond. The scenarios have five difficulty levels: Beginner, Easy, Medium, Challenging and Expert. Different objectives are available, some require the player to finish on a certain position in the company ranking list while others require the transportation of a specific amount of cargo. In some cases these objectives have additional limits, such as that the player must finish within a certain time limit. Many of the scenarios are based on real-world countries such as the United States, Switzerland, and United Kingdom and Canada. 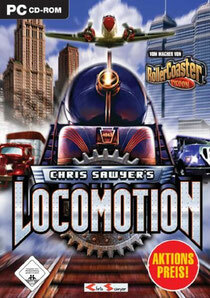 This page solely offers you vehicles for Chris Sawyer´s Locomotion for free download.